A financial crisis erupts when a large volume of assets in the financial system suddenly appears to be risky, and investors want to get rid of their holdings. These assets become "toxic" - not simply risky, but carrying a risk that cannot be quantified. Toxic assets are not traded according to a normal risk-return calculus. Given that their risk cannot be calculated, their owners just want to sell them, sometimes at any price. In 2007-2008, this was the case for a class of securities based on residential mortgages in the United States (RMBS, or residential mortgage-backed securities). 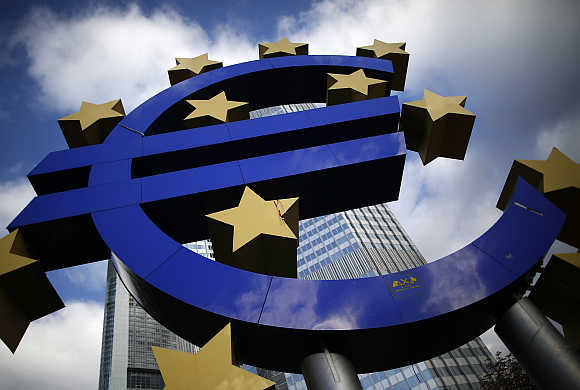 Image: Euro currency sign is seen in front of the European Central Bank headquarters in Frankfurt. During the boom phase, these securities were sold as risk-free, on the assumption that US house prices could not decline, as this had never happened before in peacetime. But this assumption was shattered when a broad-based decline in real estate prices began in 2007 and loss rates on mortgages suddenly increased. As a result, RMBS were found to be much riskier than anticipated. Initially, there was little basis for re-pricing them rationally, because the event (a peacetime decline in US house prices) was unprecedented. Moreover, banks and other financial institutions, which held large volumes of RMBS, were ill-equipped to measure the risk, and in some cases would have been bankrupted had they been forced to sell their holdings at the fire-sale prices prevailing at the height of the crisis. 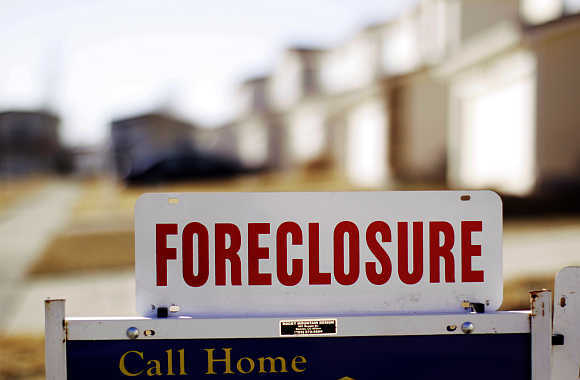 Image: A foreclosed house for sale in Denver, United States. The euro crisis followed a similar pattern. Until recently, public debt was considered the ultimate safe asset. Indeed, its risk-free status was embedded in the European Union regulatory framework, which allows banks to hold large volumes of any euro zone country's public debt without having to put aside any capital to cover potential losses. As with RMBS, this view that public debt was totally safe was underpinned by the "fact" that no advanced country, at least in the post-1945 era, had ever defaulted. Investors thus assumed that they did not need to assess the credit risk of euro zone countries' (national) public debt. 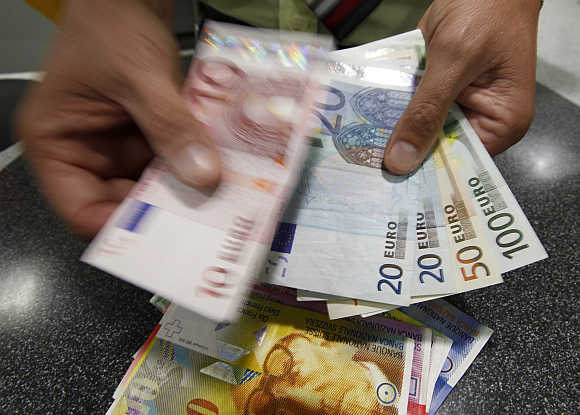 Image: A Swiss clerk exchanges francs into euros in Bern. The de facto default by Greece early this year ended investors' complacency. The government bonds of peripheral euro zone countries thus became toxic. Given the unprecedented nature of the Greek default, the market valuation of peripheral debt has been fluctuating widely, still searching for "fundamentals", such as deficit or debt levels, that could explain the evolution of risk premia over time. Moreover, many banks had so much public debt on their balance sheets that they would have been bankrupted in the event of a full-blown default. This led to extreme instability in the euro zone's banking system. 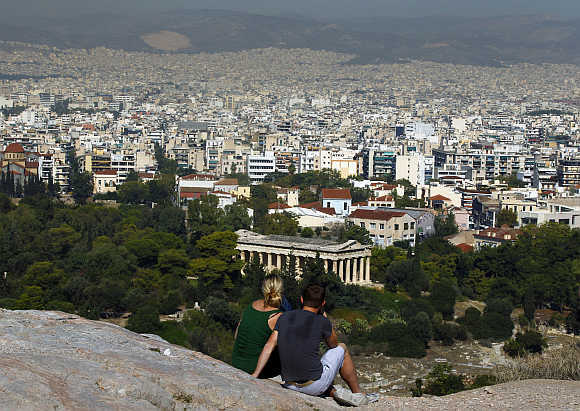 Image: Tourists sit on a hill overlooking Athens outside the archaeological site of the Acropolis. A financial crisis ends when either the doubtful debt has been socialised or its valuation has stabilised, and it has migrated to investors who are solvent enough to bear the risk. This was the case in the US. The authorities acquired some of the "toxic" assets, which over time became easier to value, as a few years of data on mortgage delinquency rates allowed investors to find ways to measure the risk. The market prices of most RMBS rebounded as losses due to homeowners simply abandoning their properties were much lower than had been feared at the height of the crisis. Moreover, holdings of RMBS migrated to institutions that were able to support and manage the remaining risk. 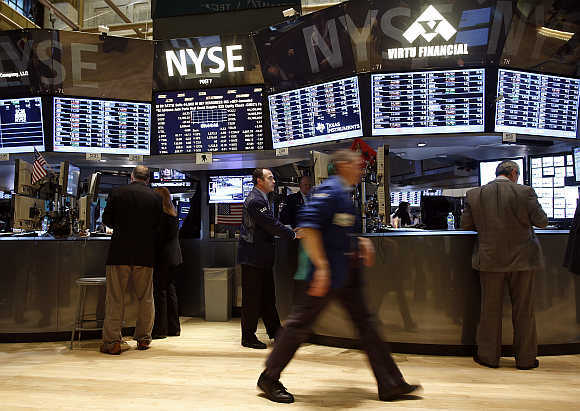 Image: A view of the New York Stock Exchange. Today, RMBS are no longer considered toxic, allowing the market to function normally again. In the end, the US authorities even made a small profit on the assets that they had acquired at the height of the crisis. This pattern can be only partly repeated in the euro zone, where both debt socialisation and a return to normal risk assessment appear more difficult. Limited capacity for debt socialisation reflects the EU Treaty's no-bailout clause, which bars outright mutualisation at the euro zone level of (national) public debt. 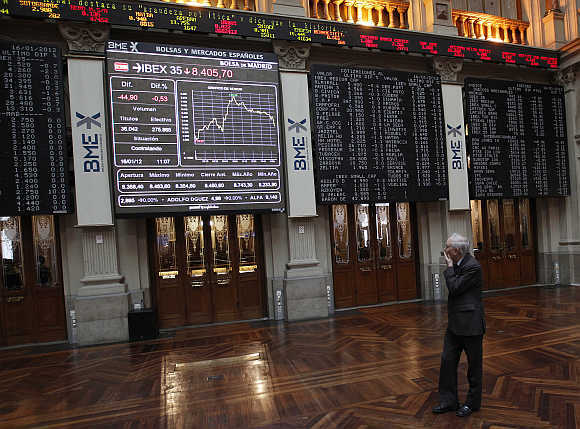 Image: A trader looks at the stock index boards at Madrid's bourse. Moreover, the lending capacity of the new rescue fund, the European Stability Mechanism, is capped at 700 billion euros ($905.6 billion), which represents only a fraction of the total public debt of the countries potentially needing financial assistance. Only the European Central Bank could implement true socialisation of national debt in the euro zone. But EU law expressly forbids any form of ECB financing of deficits. A return to normal risk assessment is also more difficult in Europe. The European Council has solemnly declared that Greece's de facto default (orchestrated through so-called "private sector involvement") remains an exceptional and unique case. 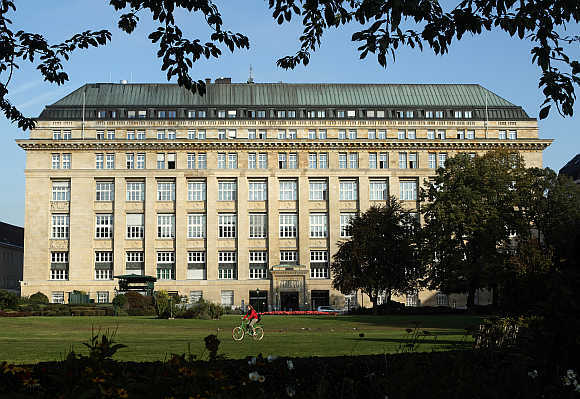 Image: A cyclist rides by Austrian national bank in Vienna. But the promise of a return to the status quo ante of risk-free public debt is not compatible with the continuing limits on the socialisation of national debt. Indeed, the risk has become more concentrated as banks in the periphery have increased their investment in their own countries' bonds. A sovereign default in Europe will never be a mere value to be plugged into some statistical risk model. These differences imply that the return to normal market conditions will be slower in the case of the euro crisis. 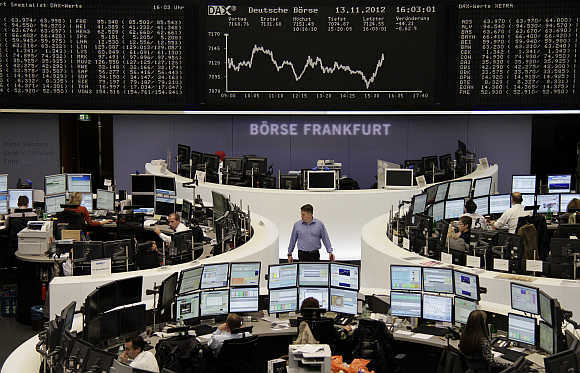 Image: A view of the Frankfurt stock exchange. Nevertheless, the crisis should abate somewhat, because the most risk-averse institutions have by now sold their holdings of peripheral countries' sovereign debt. Moreover, the ECB has clearly stated that it will not allow the euro to disintegrate. That guarantee has insured investors against their biggest risk. 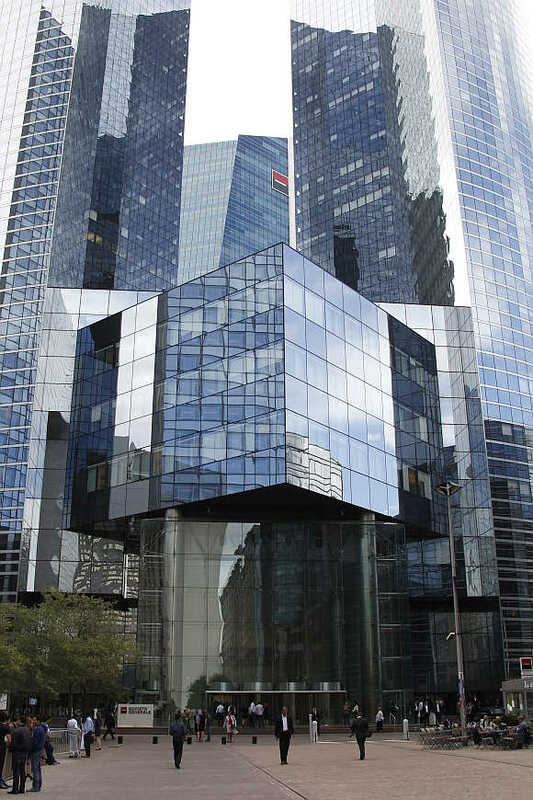 Image: Headquarters of French bank Societe Generale at La Defense, west of Paris.